I have a confession to make about this card - I made it for a friend’s little boy who was turning three, and forgot to send it! My husband and I were ill for nearly a whole week, luckily the days when we were most sick didn’t overlap so we were able to take it in turns to look after our baby with a bit of help from my mother-in-law as well (who then got sick after she had been to see us!). Luckily baby S didn’t get ill at all which was a huge relief! That whole week passed in a blur and it was only some time later I realised I had missed the birthday and not sent the card. Sorry Alex! I’ve decided to share it now as I think this is a really cute theme for children that works for both girls and boys. I bought a set of clear stamps from eBay (which didn’t have a brand - look up ‘pirate clear stamps’ on eBay and you will find them). I had some sea themed backing paper that I hadn’t really used before as it was a tricky design - not a patterned paper as such but most of it was plain blue or similar with a detailed design in one corner. I found it hard to know what I could add to the card to complement it without covering up the design but also without the backing paper stealing the show - but these pirate stamps were perfect. I stamped the boy pirate onto white card and coloured him in with Promarkers and did the same with the treasure chest and boat, and stamped the words ‘you’re a treasure’ directly onto the card, which I then went over with a black Promarker. absolutely adorable Caroline ... Thanks for sharing! 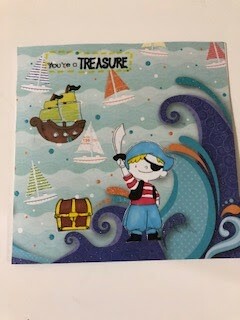 Awesome card for a boy, absolutely love the waves and happy little pirate. Thank you so much for joining SheepSki Designs challenge and I hope you are having a lovely Fall.